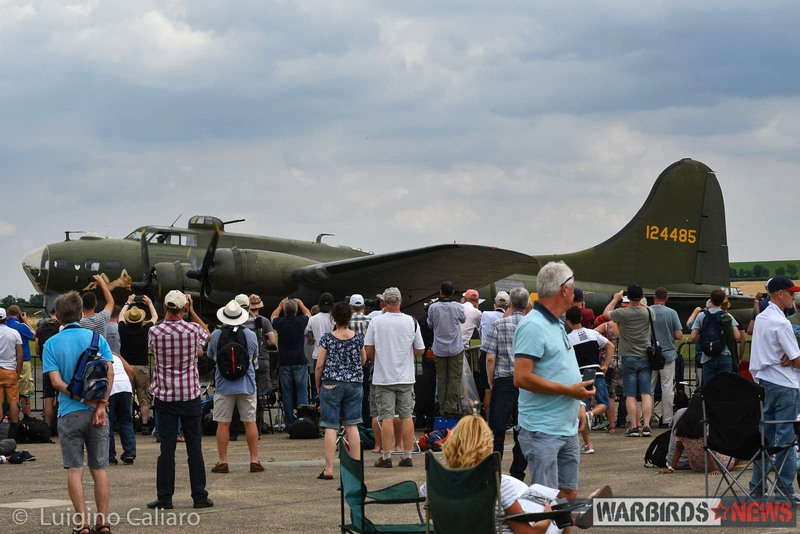 This year saw the twenty fifth anniversary edition of the annual Flying Legends air show at former RAF Duxford, the Imperial War Museum’s facility near Cambridge, England. 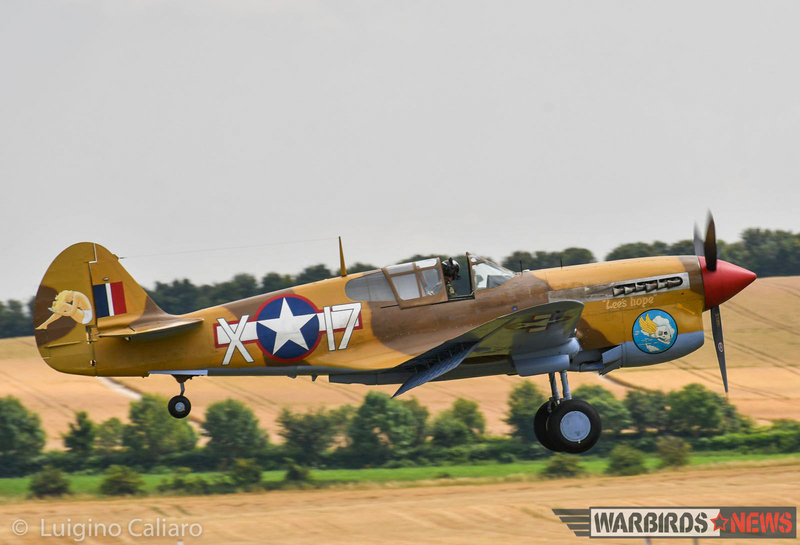 The locally-based Fighter Collection organizes the event, which has become the most important warbird display in Europe. 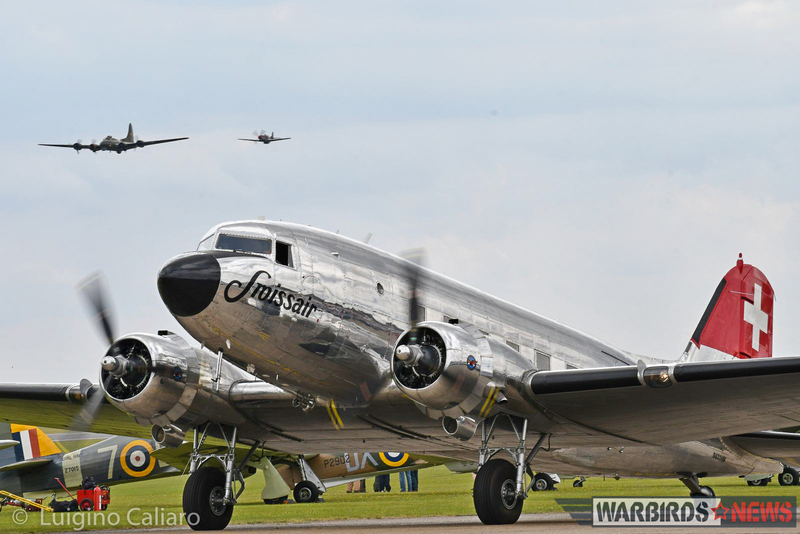 This year’s show took on even greater significance as it also marked the centenary for both the Imperial War Museum and Duxford air field. 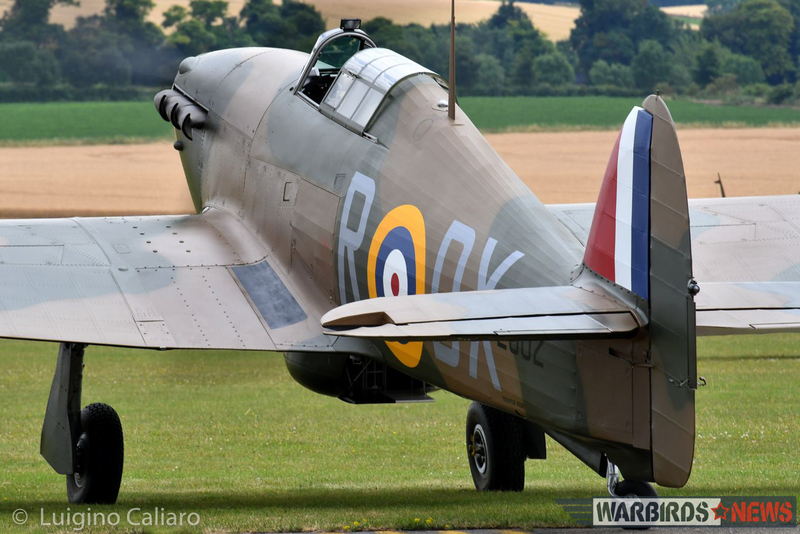 This merits a short historical review for both…. 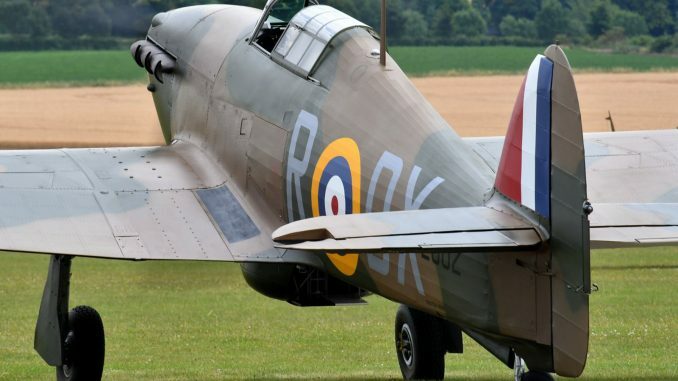 The British Government created the Imperial War Museum in 1917 with the initial aim of gathering the stories and artefacts of the Great War to preserve for future generations, but it has since expanded to include much more or Britain’s military history. 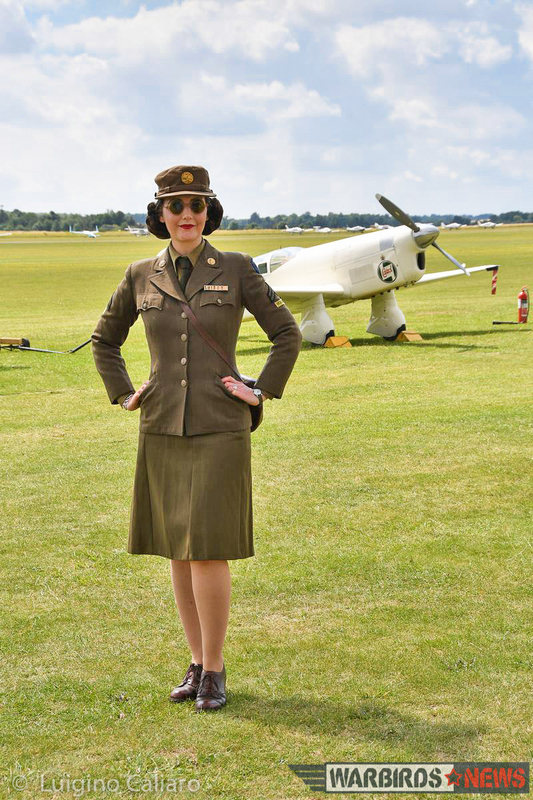 The primary museum site is located in Lambeth, London, but there are four additional public facilities now, and one of these is the former RFC/RAF station at Duxford. 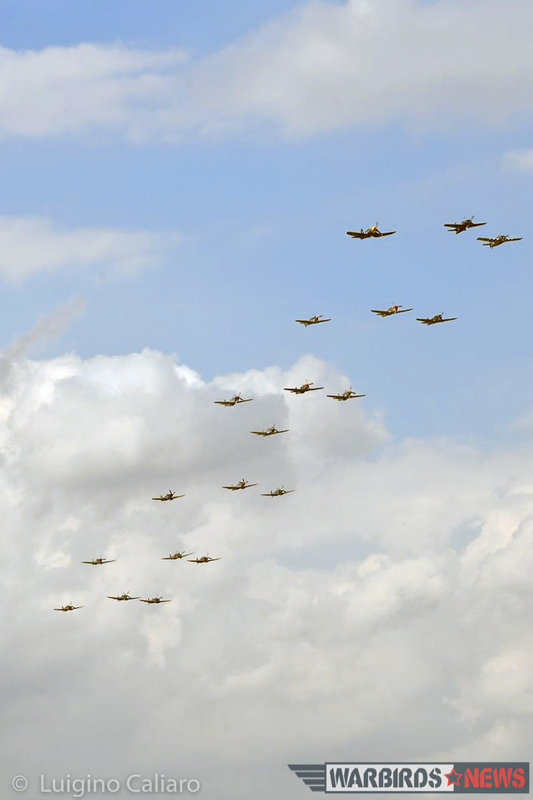 The Royal Flying Corps established Duxford aerodrome in 1917 to conduct flying training. 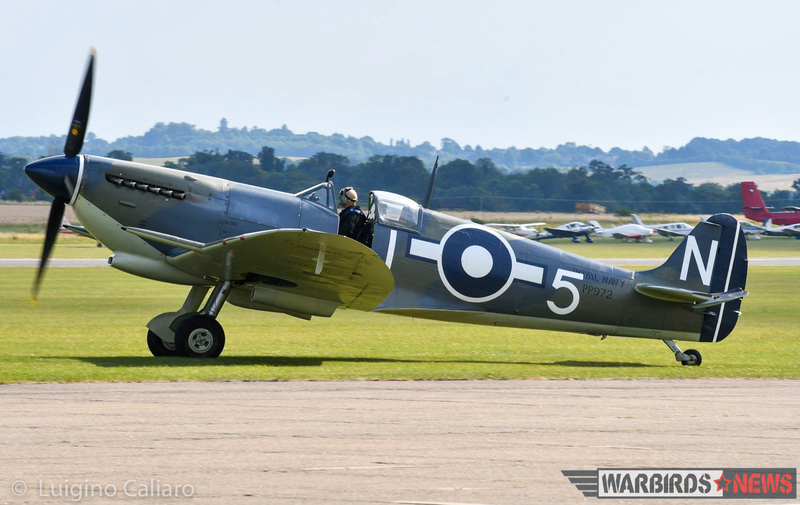 Post-war it became a fighter station, and on August 4th, 1938 the first operational Supermarine Spitfire unit, 19 Squadron, took up residence. 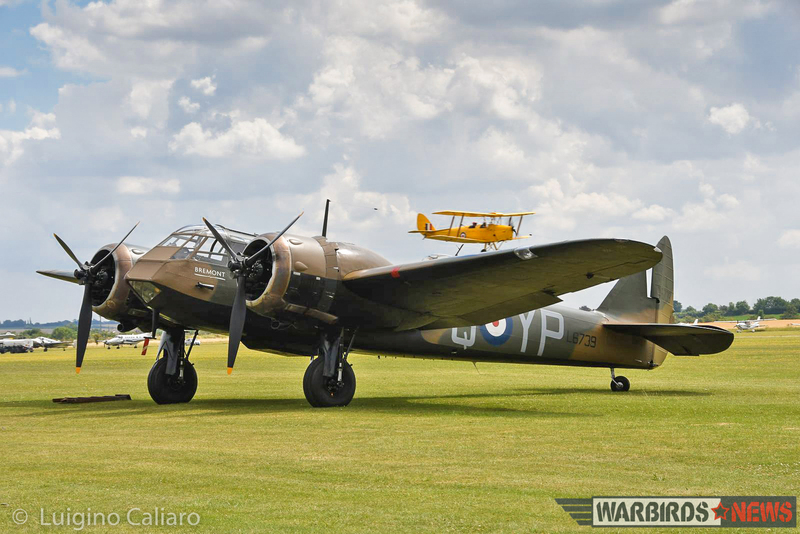 Duxford served an important role during WWII. 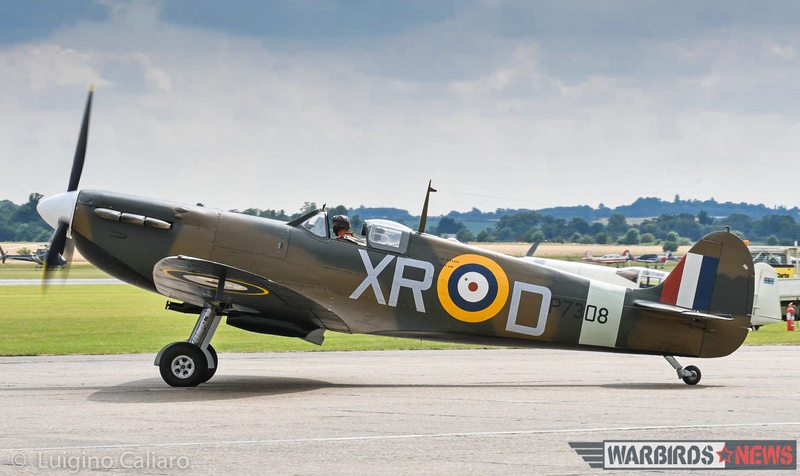 The famous RAF fighter ace, Douglas Bader, commanded 242 Squadron here during the crucial days of the Battle of Britain. 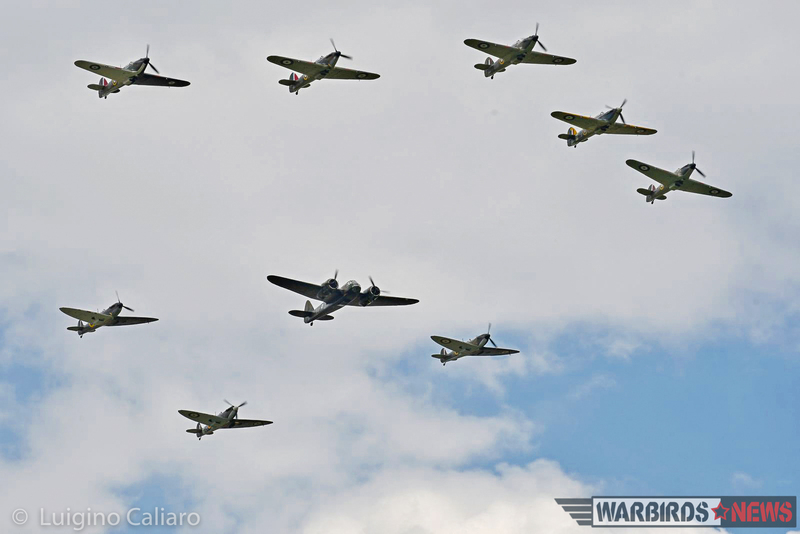 In April, 1943, and now under American control, the field became home to Eight Air Force’s famous 78th Fighter Group. 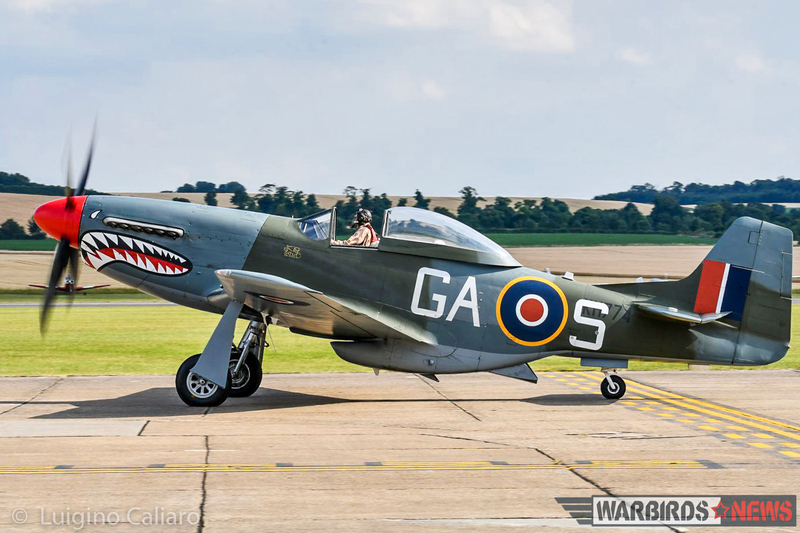 After WWII, the Cambridgeshire base reverted to RAF control, and received modifications, including a lengthened concrete runway, to allow jet fighter operations. 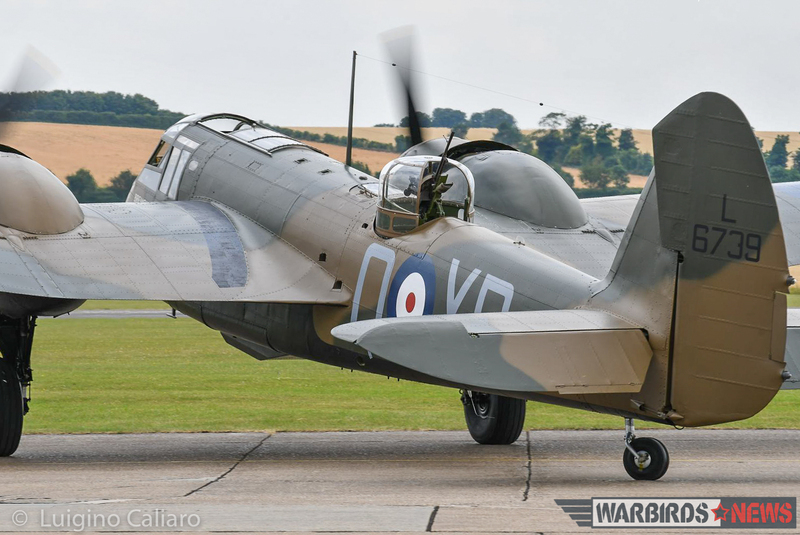 But in 1961, RAF Duxford stood down as an operational facility, as the runaway and base infrastructure were not compatible to the requirements of the more complex jet aircraft then entering service. 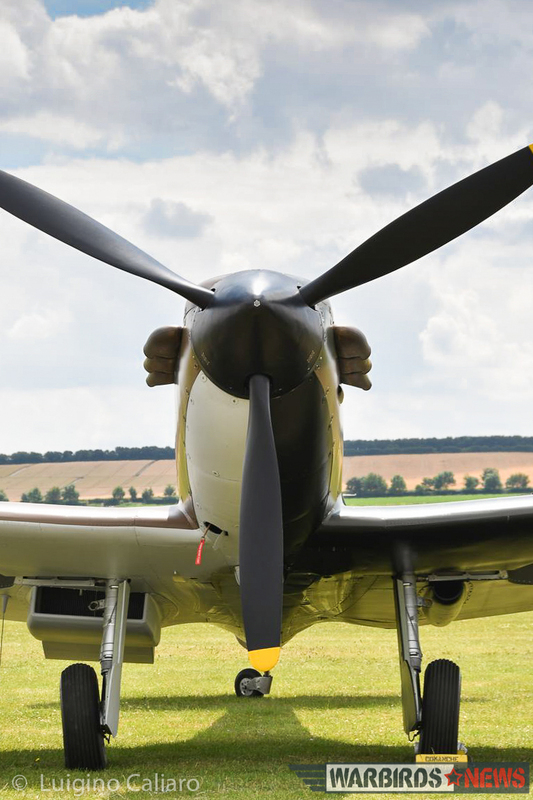 As many readers will know, Duxford played a major role in filming the motion picture The Battle of Britain during 1968 which once again saw Spitfires and Hurricanes flying from the field. But in 1969, the British Ministry of Defense decided to sell off the old station. The situation looked bleak for a while, with the site seeming destined for demolition, but thankfully this didn’t happen. 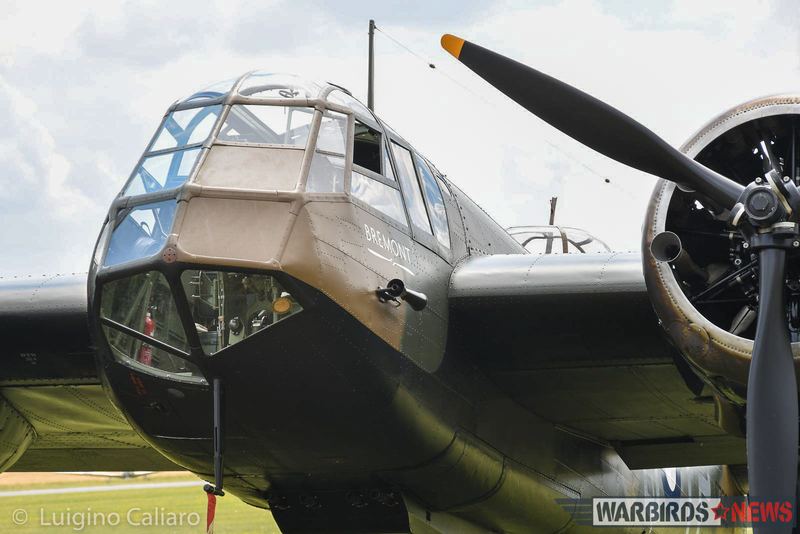 The local Cambridgeshire Council joined forces with the Imperial War Museum and Duxford Aviation Society to purchase the field and make it the home for the IWM’s burgeoning aircraft collection. 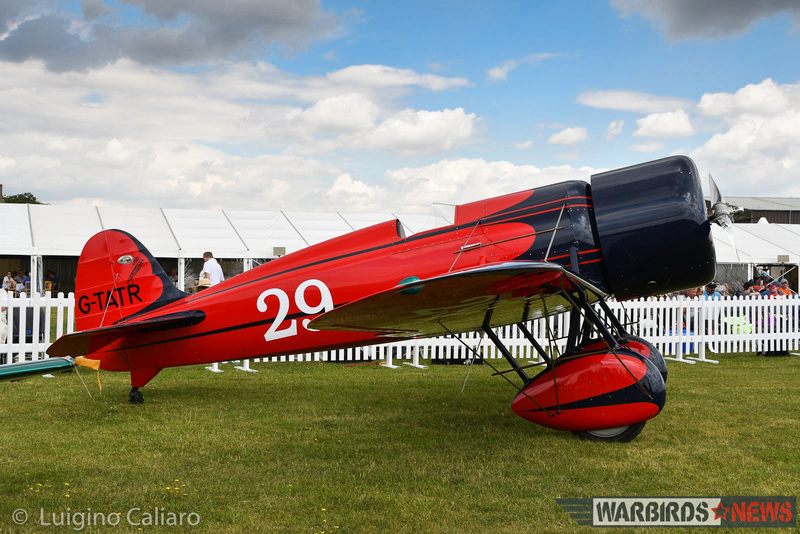 But in a brilliant move, the field also became home to private vintage aircraft operators and restoration companies, so that it became a living, breathing, constantly evolving historical setting, unique in the world today. 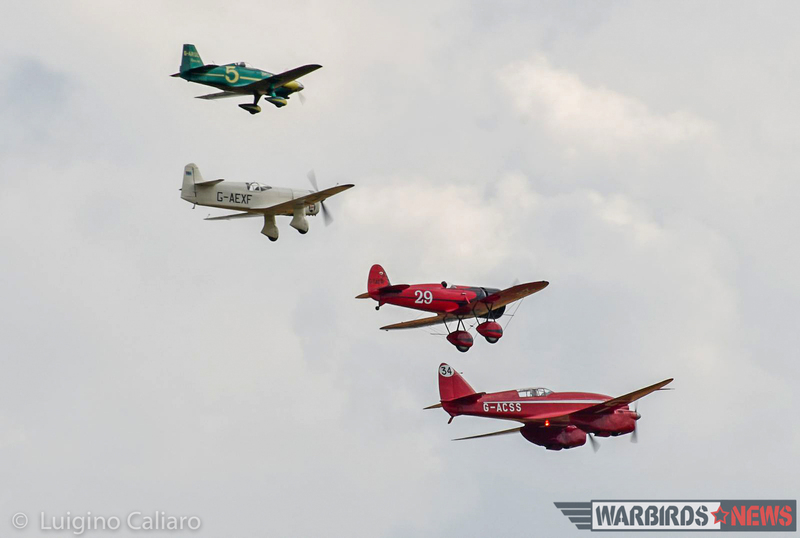 To provide a fitting celebration worthy of the historic milestones reached this year, Flying Legends made an exception to its usual mantra that only piston-engined aircraft can fly during the show. 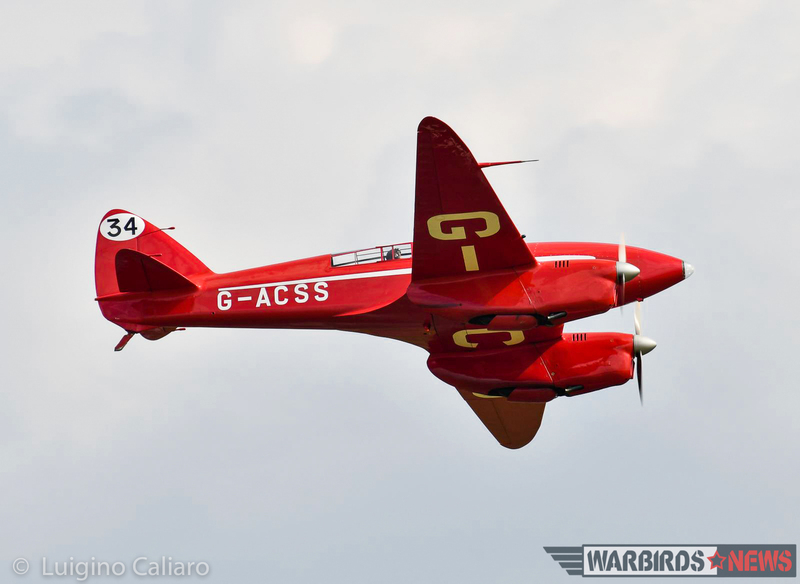 On the Sunday morning, the famed RAF aerobatic display team, the Red Arrows, stunned the crowd with a spectacular and aggressive performance. 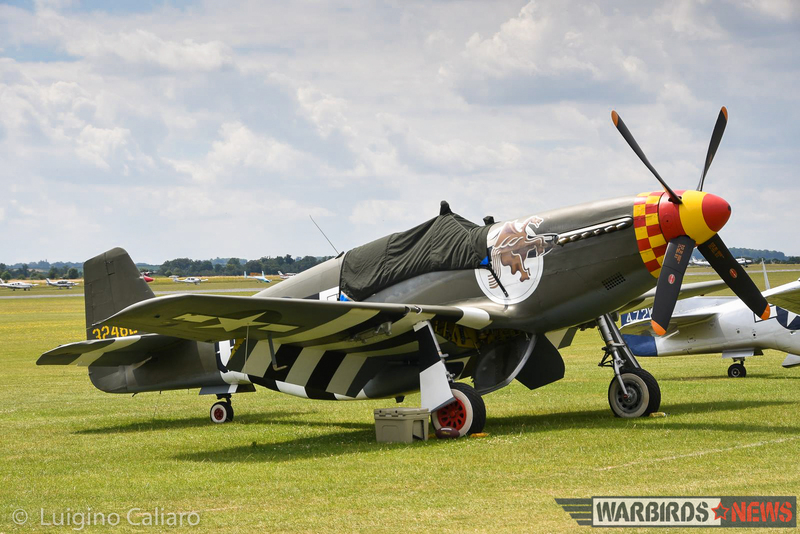 Aircraft from The Fighter Collection usually form the core of the main warbird display, and so it was this year along with a host of types from the continent. 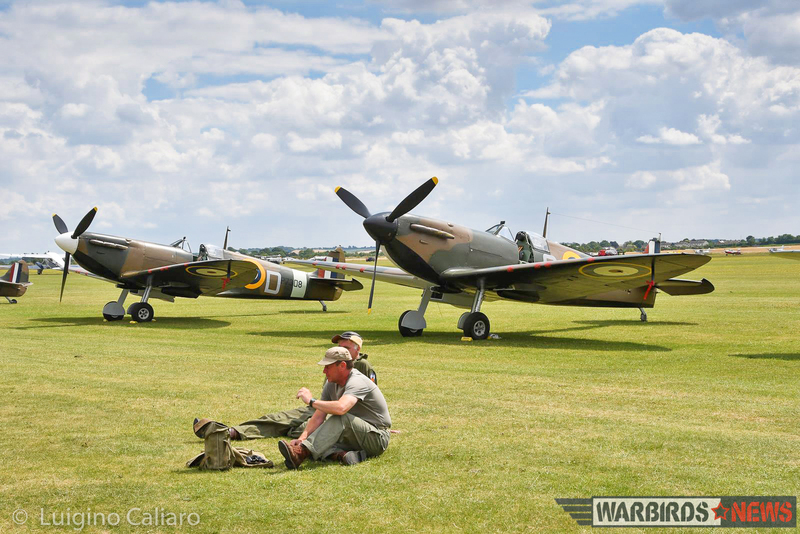 However, each year in the recent past has seen a surprise guest or two from ‘across the pond’ join in the fun. 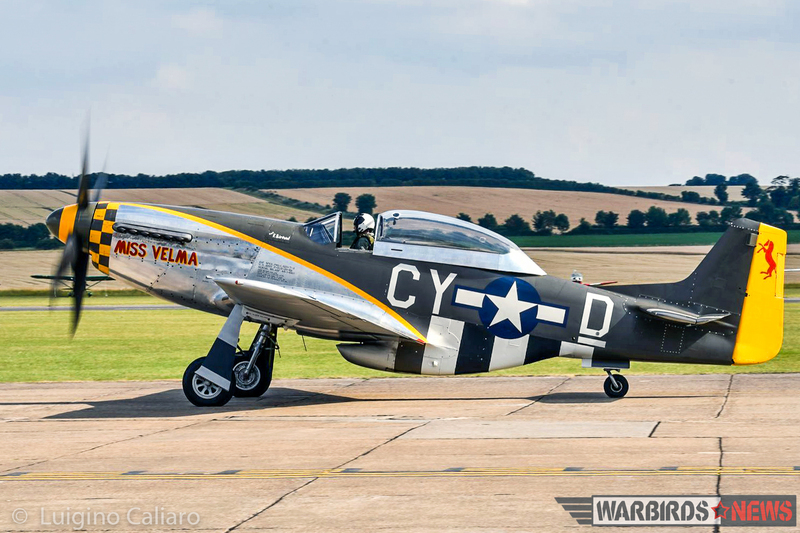 This year, two Mustangs belonging to Dan Friedkin visited Duxford from the United States. 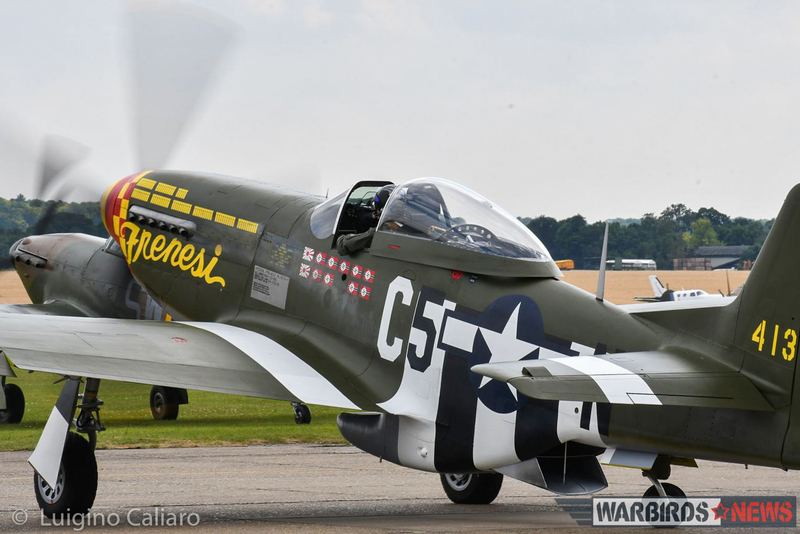 This included F-6K 44-12852, marked as Frenesi, a 357th FG P-51D regularly flown by the ace Lt.Col. 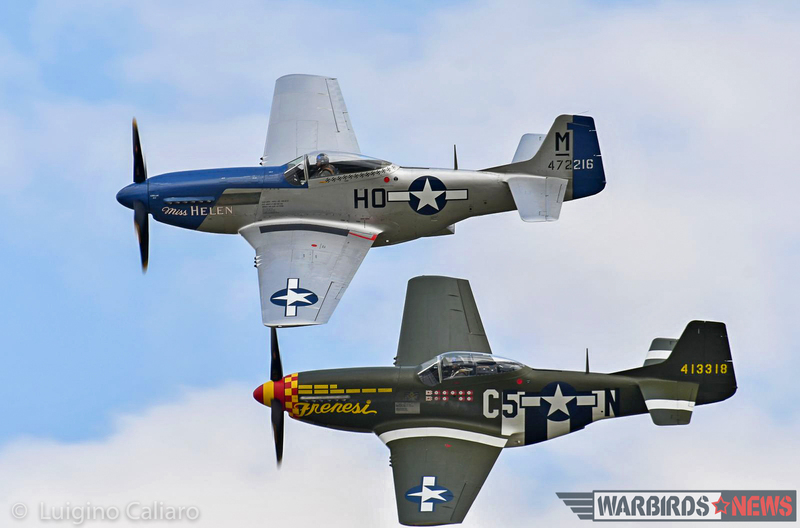 Hayes, and the resurrected P-51B 43-24837 Berlin Express, once piloted by Lt. Bill Overstreet. 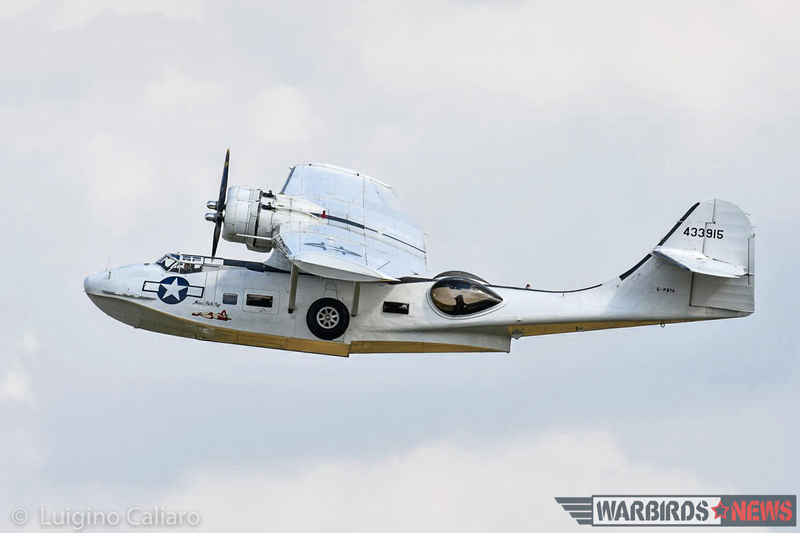 The latter aircraft flew all the way from its home in the United States, by way of Canada and Iceland, to participate in the show. During the Saturday display, Berlin Express experienced a canopy failure which saw the bulbous “Malcolm Hood” disintegrate in a shower of plexiglas shards during a high speed pass. 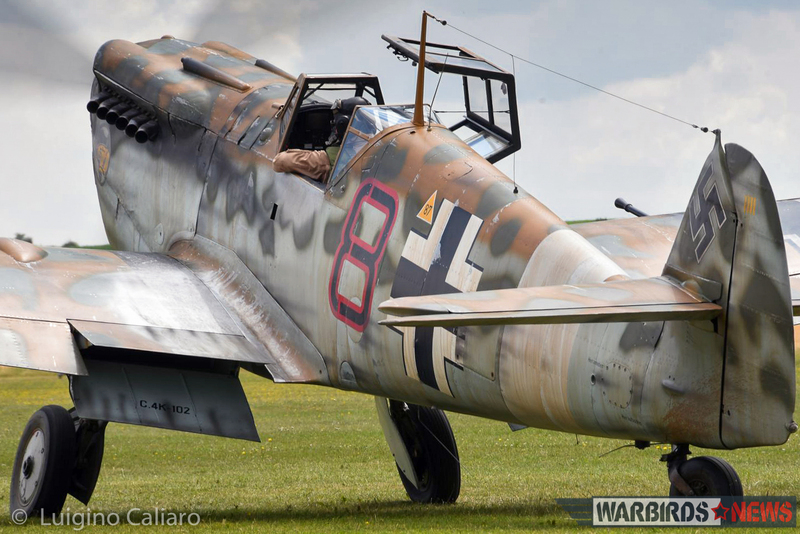 Some of the fragments damaged the empenage, but thankfully the pilot managed to land safely. 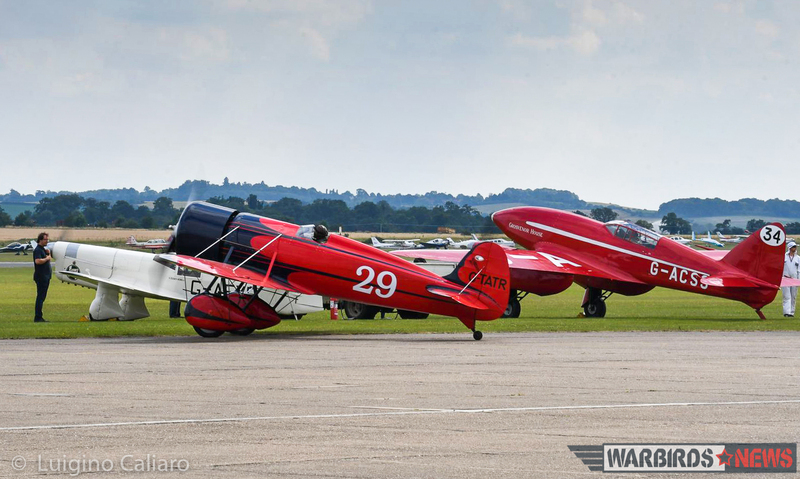 This year’s air display also saw the involvement of some particularly significant historic British types, represented by the magnificent de Havilland DH.88 Comet Grosvenor House and the Percival Type E Mew Gull from the Shuttleworth Collection, which also flew in formation with a beautiful Travel Air R and the Le Vier Cosmic Wind. 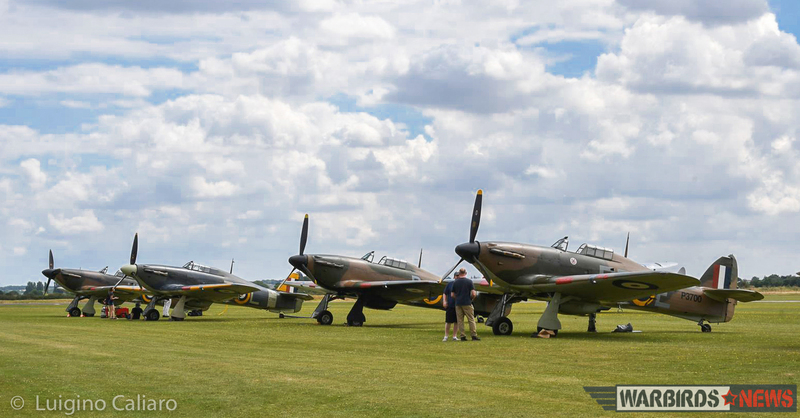 The importance of Duxford airfield in British aviation history was evidenced by the notable participation of British WWII-era fighters, with the presence of some five Hurricanes and twelve Spitfires! 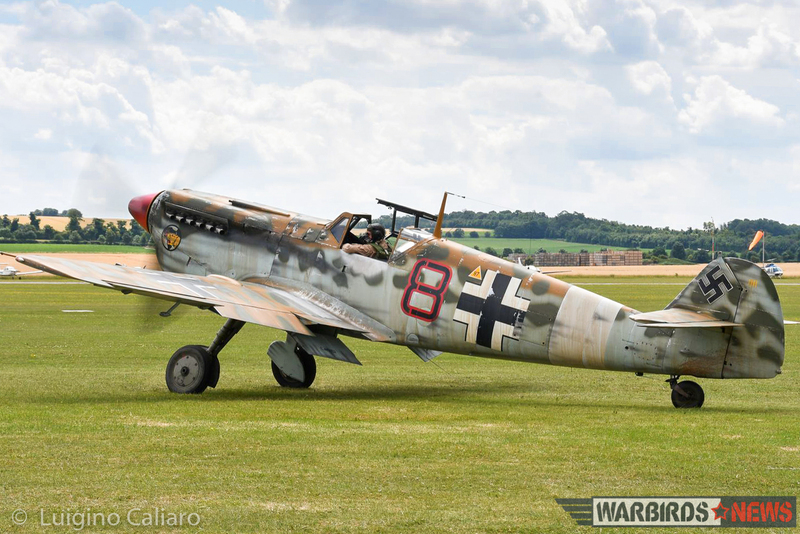 Sadly, the hoped-for participation of the Bf 109E from the Biggin Hill Heritage Hangar, originally scheduled in the programme, failed to materialise, although the Luftwaffe was well represented by a Hispano 1112 Buchon from the Aircraft Restoration Company, which was shown to the public in a new but temporary desert colour scheme reflecting the colours of Bf 109E-7/Trop “Black 8” flown by Lt Werner Schroer of 8/JG 27, operating in North Africa during the summer of 1941. 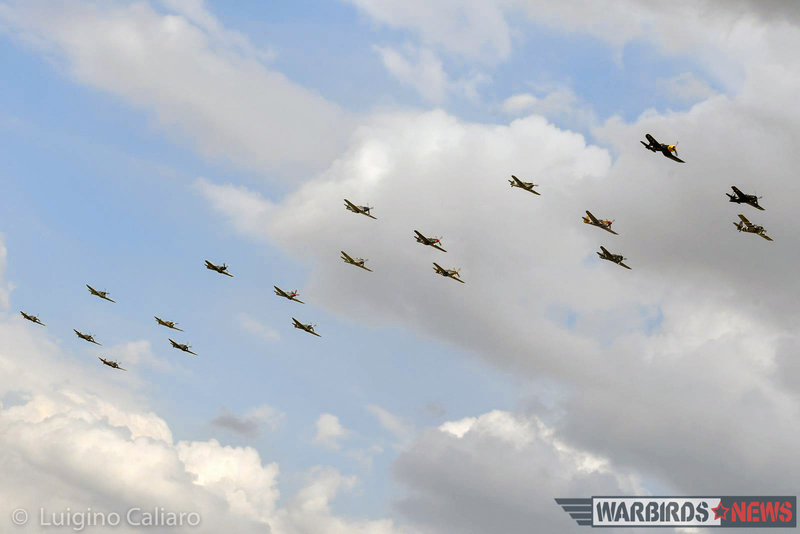 The stunning “Balbo formation” at the end of the show, where all the fighters get up in the air in one massive formation, made two flypasts of the airfield. 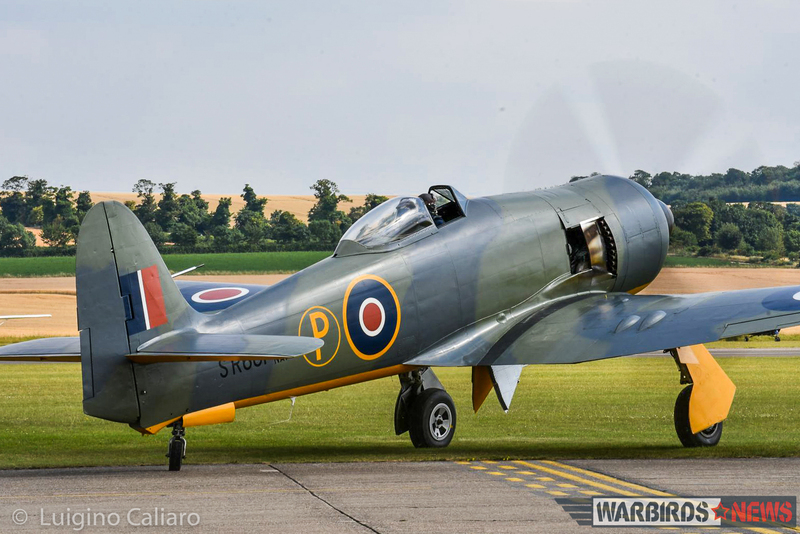 While the aircraft for the Balbo took off and formed up, the crowd were treated, as usual, to a spirited exhibition from the “joker”, interpreted this year by Nick Grey who flew majestically in a Hawker Sea Fury painted in the colours of its prototype. 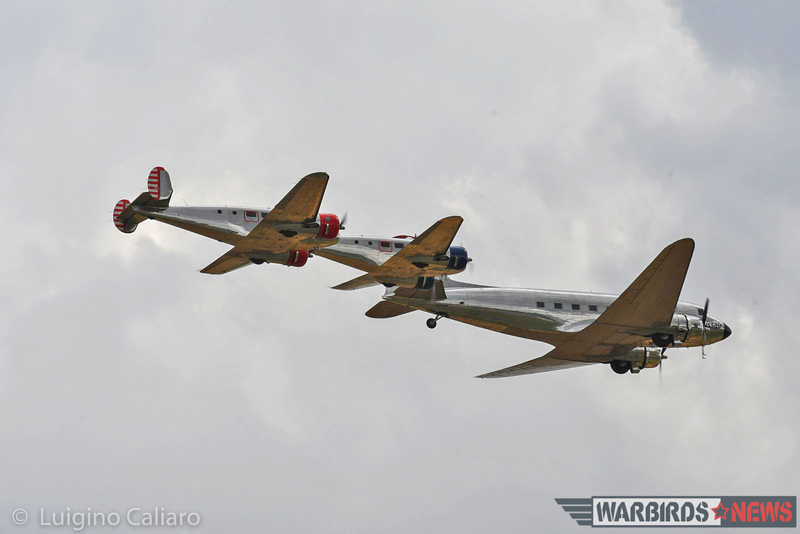 The Balbo was fantastic, but just when everyone thought it had all gone according to plan, TF-51D “Miss Velma” developed a serious engine problem at the end of the second pass. 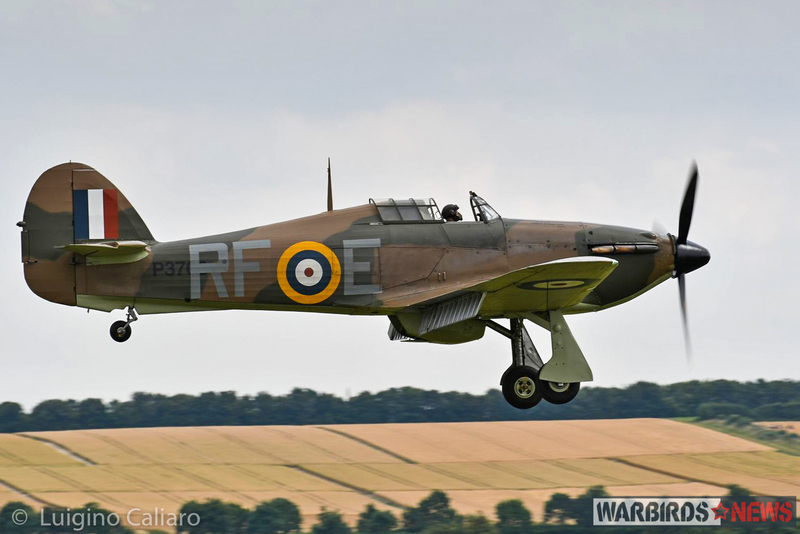 The pilot elected to put the stricken fighter down in a wheat field beside the aerodrome, rather than risk trying to make it a little further to the runway. 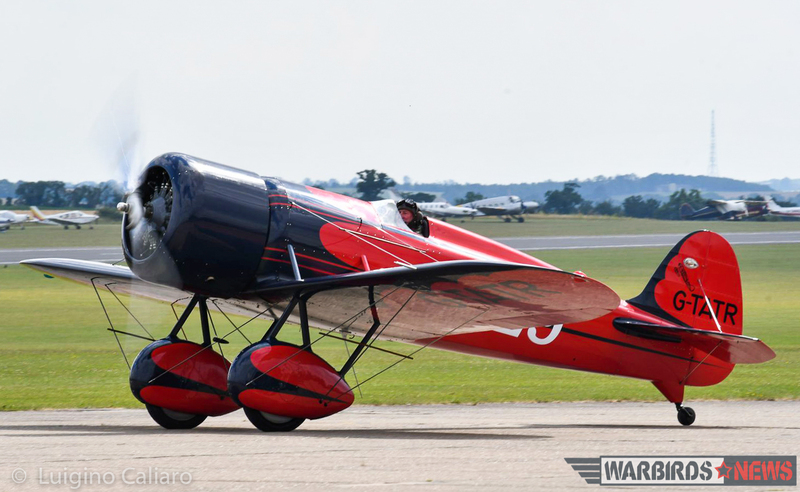 With supreme professionalism, the pilot ensured that an emergency did not become a tragedy. 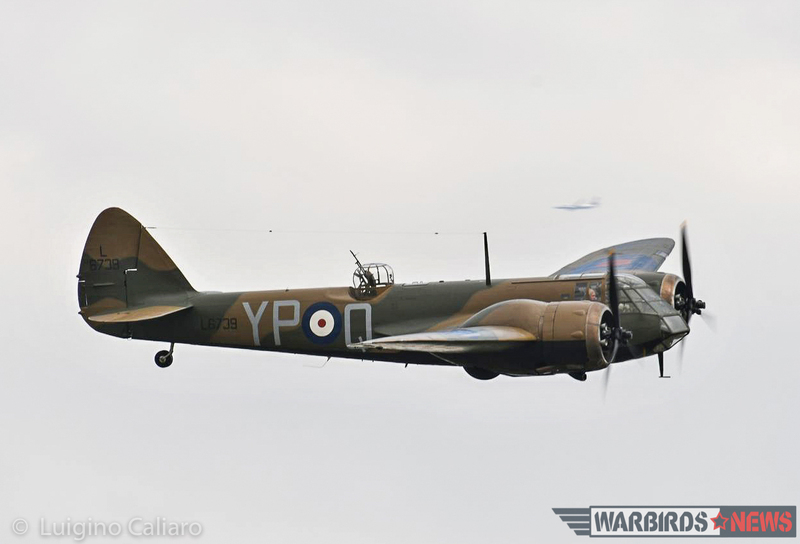 While the aircraft did receive significant damage to the wings, belly and propeller, the pilot was able to walk away from the incident, which is what truly matters. 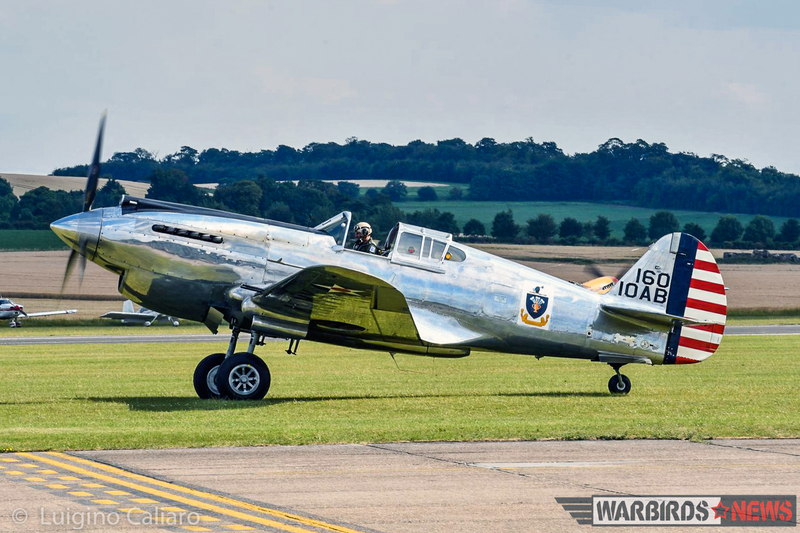 With a little time and money, the Mustang will be flying again before too long. 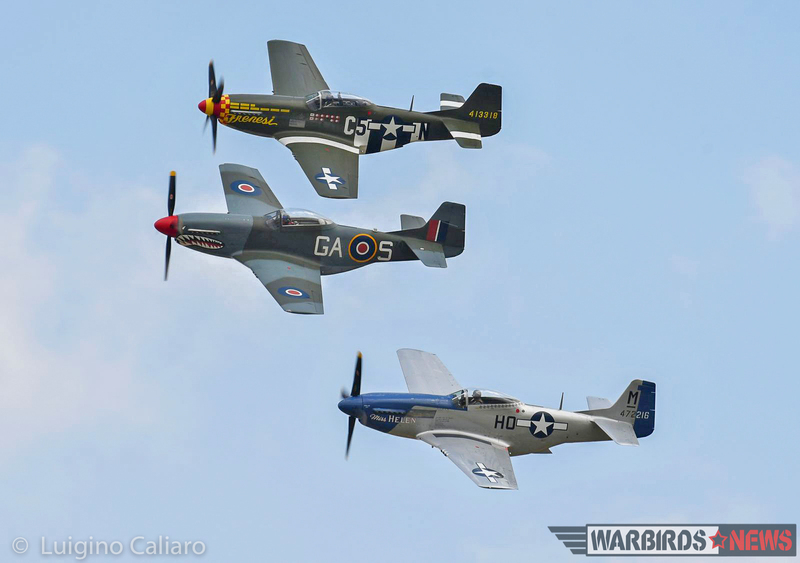 Despite the two Mustang incidents, this year’s Flying Legends display was a fantastic show, safely held under beautiful skies. 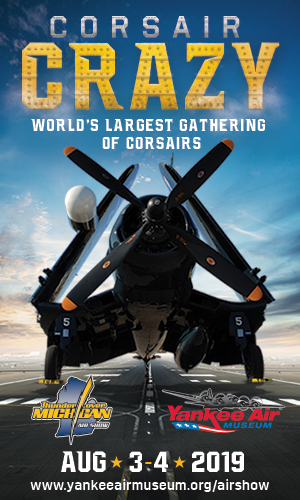 It is one of those special events that every warbird enthusiast should attend at least once if they can! 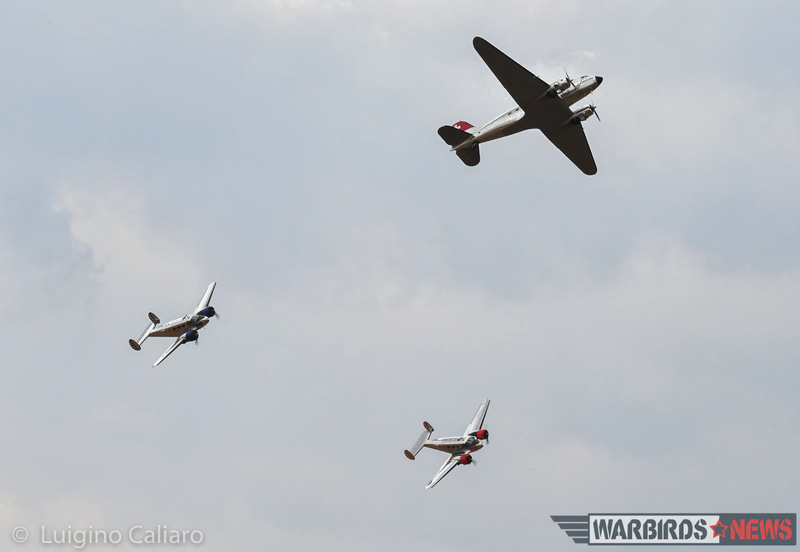 WarbirdsNews wishes to thank Luigino Caliaro for his reporting and magnificent photography, as always! To see more of his work, please visit his site HERE. 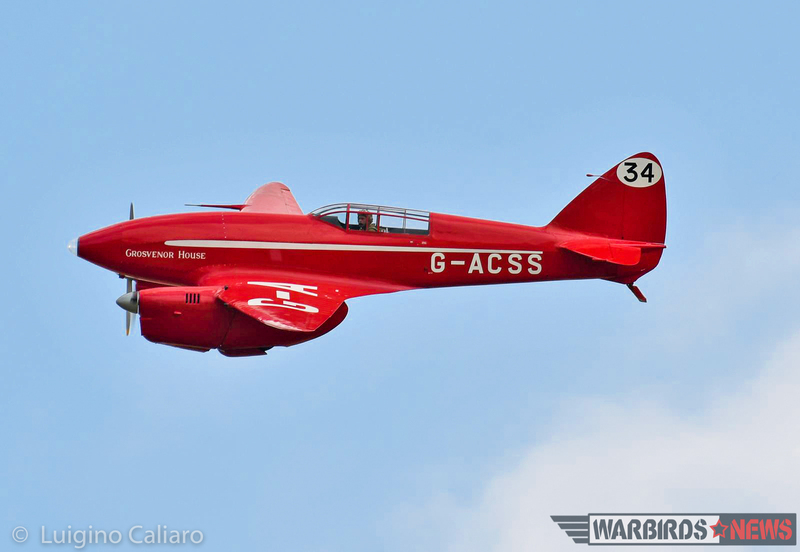 Flown in tiger moth this year what an outstanding place duxford is!